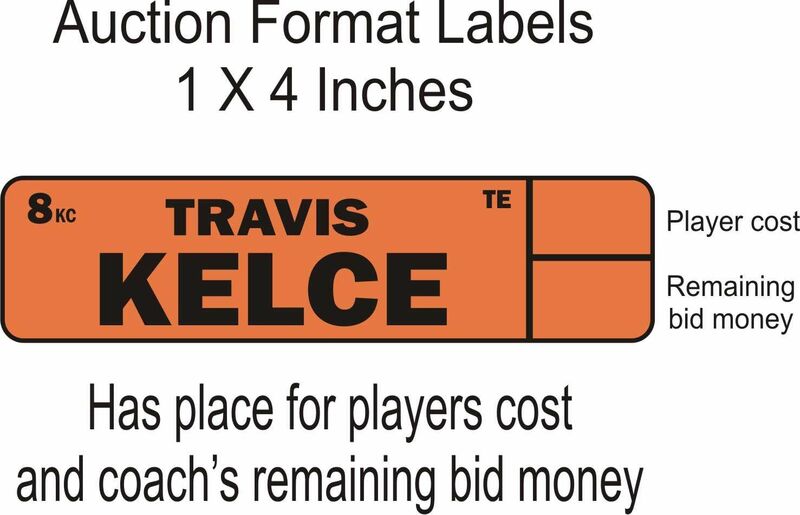 Every Draft Kit comes with a complete set of pre- printed player labels. Labels are color coded by position and in each position the players are listed alphabetically. The labels include the player's name, position, bye week and team. We don't include goofy things like pictures or logos which only take up space and make the text smaller! and are self adhesive / peel and stick. The different size Draft Kits are determined by the different size labels that are included. All our labels are PROFESSIONALLY PRINTED, not done on someone's home inkjet or laser printer. 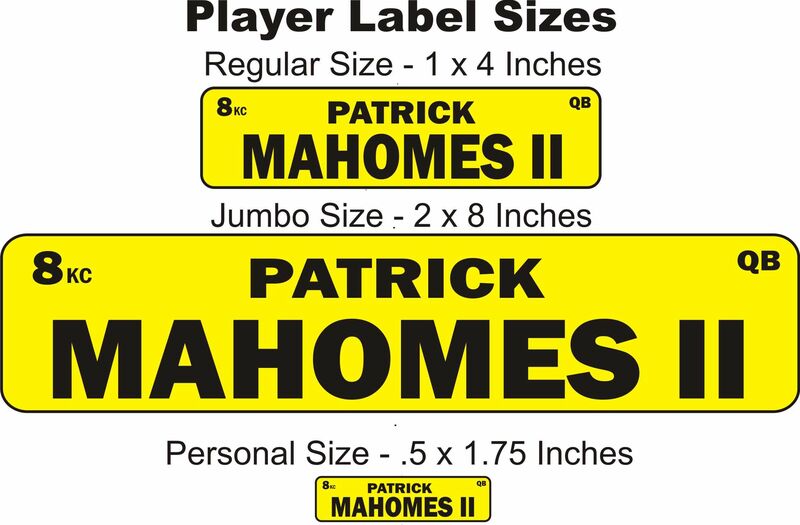 click here to order downloadable player labels. The most important dimension of a label is the length because names are longer than they are high and the more length, the larger the font that can be used. A 1 1/2 by 3 inch label which might be bigger in terms of total square inches than a 1 X 4 inch label, but would have to use a smaller font because it is only 3 inches wide. The actual size you see above will depend on the size of your monitor, and your resolution. Please use these graphics only for a rough idea of the size. Wide Receivers - 140 players Team Names for Defenses - Special Teams. Because our labels are professionally printed, they are all printed at one time after the NFL Draft. To make sure the labels are up-to-date for your draft visit our player label update page, which has all the last minute moves and signings that might change the team or by week. We also list players to add that have shined during pre-season or that have moved up in value due to injuries, cuts or trades. all Bye Weeks and Teams are up-to-date with last minute signings. We offer Individual defensive players (IDPs) for leagues that need them. This set includes the top: 90 - Defensive Linemen , 90 - Linebackers , 90 - Defensive Backs, plus blanks ( 30 for the regular and 10 for the jumbo). Included in this list are the top Sackers, Tacklers, Interception leaders and rookies, spread throughout the three positions. For leagues that use a Head coach or an offensive line or any other team position, we offer a extra set of NFL team names in separate colors from the set included with the kit. If you were going to pick Bill Belichick, you would select the New England label. The labels are not meant to be reusable. While you can peel the labels off of the board and move them around if you are careful, it would not be practical to remove them all , put them back in order on the wax sheets, and then hope they will all stick again the next time. We also offer auction format for leagues that bid on players. The auction format has a space for the players cost and the coach's remaining bid money. When the next player is picked and placed below the first label, you can then subtract from the top label's remaining bid money to give a new total and so on. This works as a subtraction grid.